The tension between the imperatives of “market sovereignty” and the entrenched principle of “state sovereignty” of authoritarian oligarchies will define the open-ended tendencies and outcomes of the ongoing regionalisation process in Southeast Asia. For the 48-year-old Association of Southeast Asian Nations (ASEAN), the goals of political, economic, and cultural community-building and regional integration have literally become moving targets. In 1997, the organization’s 10 member countries – Brunei, Cambodia, Indonesia, Laos, Malaysia, Myanmar, the Philippines, Singapore, Thailand, and Vietnam – spelt out the “ASEAN Vision 2020” for the establishment of a region that is peaceful and stable, economically integrated, and holds a common cultural identity. Then in 2007, with the adoption of the ASEAN Charter, they declared with heightened confidence that their integration targets can be accelerated earlier, or sooner than 2020 – thus, the much-publicised “ASEAN Community 2015” came into existence. Despite attaining virtually zero tariffs on trade leading up to the 2015 deadline, overall implementation of integration commitments have been going at a slower pace than required at both the national and regional levels. Thus, in their summit conference in 2013, the region’s leaders floated the idea of a “Post-2015 Vision” and created a high-level task force to carry out a visioning process to write the blueprint for the “ASEAN Community Vision 2025”. This blueprint is expected to be adopted and presented as the Kuala Lumpur Declaration in the upcoming summit in November 2015. It basically reaffirms the long-held vision to realise a region that is “politically cohesive, economically integrated, socially responsible and a truly people-oriented, people-centred and rules-based ASEAN”. In an attempt to put a positive spin on their unmet objectives at the time of the 2015 integration deadline, ASEAN has recently promoted a key message, “2015: Just the beginning”, for the continuation of a protracted regional integration process. Only the target dates of the ASEAN community project have been changing over the last couple of decades. What will remain intact in the forthcoming Vision 2025 are the core ASEAN values of “state sovereignty” in the political-security and socio-cultural pillars, plus the neo-liberal principle of “market sovereignty” in the economic pillar. The regional integration framework for the ASEAN community delineates the region-wide convergence of 10 member countries on the economic pillar while maintaining a diversity of political and cultural communities. The idea is to create a single economic system of competitive capitalism adapted to distinctive political and cultural structures, forming an open regional bloc integrated into the world market. The new 2025 integration deadline is again only symbolic of the project’s prolonged process of building ASEAN’s economic, political, and cultural community. A more important focus of debate, therefore, is not on whether the new blueprint’s objectives will be realised by 2025, but on the logic and the most likely effects of the “process” of integration itself, both on individual member countries and on the regional scale. It would be worthwhile to understand and reflect upon the impact of an intensified process of neo-liberalisation in the next 10 years vis-à-vis the enduring political and economic structures – characterised by a variety of authoritarianisms and oligarchies – in Southeast Asia. There has been relative peace and stability among the 10 Southeast Asian neighbouring countries for at least the last 20 years. This phenomenon can be regarded as a “peaceful coexistence among authoritarianisms”, since most ASEAN member countries that are at peace with each other are, in essence, non-democracies. In recent years, Southeast Asia has been a region of non-democratic political regimes, namely: semi-authoritarian governments in Malaysia and Singapore; military rule in Myanmar and Thailand; one-party states in Cambodia, Laos, and Vietnam; and the monarchical state of Brunei. Even the relatively “more democratic” countries of the Philippines and Indonesia also had decades-long histories of dictatorships and still have some features of authoritarianism in their respective socio-political structures, including the practices of executive dominance and the persistence of human rights violations and abuses. The relative peace in the region has been largely credited to the prevailing norm of “state sovereignty” in the conduct of security relations among nations, specifically observed through the policy of non-interference in a country’s domestic political affairs. Among ASEAN’s three pillars of community-building – namely, the ASEAN Political and Security Community, the ASEAN Economic Community (AEC), and the ASEAN Socio-Cultural Community – the AEC has generated much public attention and debate. In the context of the post–Cold War world, during which time there have been markedly peaceful intra-regional relations between states, the AEC is envisioned as the fulcrum of ASEAN’s regional integration project to attain the goals of establishing a region with a competitive single market and production base through a series of economic and institutional reform measures. Under the AEC blueprint, the economic pillar is being peddled as a separate sphere – and thus must be immune – from the political and cultural pillars. Separating “the economic” from “the political” is a classic doctrine in the ideology of capitalism. It has been continued by proponents of capitalism’s current configuration, which has been referred to as “neo-liberalism”, an ideology for free markets and competitiveness. Neo-liberalism, which is the ideology underpinning the AEC project, regards “the market”, “the state”, and “society” as separate entities that are supposed to mind their respective businesses and functions. As such, neo-liberalism posits: a) that the market is a realm of freedom, choice, and progress, and must take precedence over other social variables; b) that society is simply a tapestry of individuals; and c) that the state is best kept to its minimal function by letting market forces (i.e. the private sector, firms, companies, or corporations) be the ultimate director of socio-economic relationships, the ecology, and human lives. The assumption is that the internal mechanisms of the free market under laissez-faire capitalism, in which states abstain from interfering in the workings of the economy, shall generate economic growth that will trickle-down for the benefit of society as a whole. The AEC scheme is aimed at cementing “market sovereignty” through the policy of government non-intervention in the economy while preserving “state sovereignty” of individual ASEAN member countries through the policy of “non-interference” in domestic political and cultural affairs. But since there is practically no clean separation between the political, the economic, and the cultural spheres of social life, what ASEAN’s “convergence club” model of regional integration suggests is that economic neo-liberalism will have to be embedded in a variety of political regimes and cultural orientations in the region. In other words, neo-liberal capitalism can be made to operate even within an authoritarian, or non-democratic, political framework, as well as with different cultural or religious belief systems. This formulation is particularly plausible because the ASEAN community-building project is a process of regionalisation without political-economic democratisation. The political, economic, and cultural spheres are organically connected to each other. Hence, there is co-evolution between these spheres. But economic capitalism – specifically the capitalist mode of production – has tremendous powers in reshaping or recreating politics and cultures, in transforming societies, as well as in changing attitudes and the behaviour of citizens. The absence of “political will” on the part of state functionaries to resolutely institute necessary market reforms is certainly a considerable barrier to the process of deepening economic regionalisation in Southeast Asia. Yet, an even more intractable blockage to realising the AEC vision of completing “open regionalism” with a single market comes from strong opposition posed by sections of the local elite powerbrokers to particular neo-liberal policies of liberalisation and privatisation that are perceived to go against the domestic vested interests of these politically connected businesses and corporations. If it is any indication, heads of states are the ones who have signed and authored the institutionalisation of the AEC at the regional level. By acceding to the AEC, states have technically locked themselves in to the disciplines of neo-liberal capitalism. But the point of concentration of AEC implementation is still at the domestic level, where oligarchies are well-placed. The power, wealth, influence, and status of Southeast Asian oligarchies do not simply come from kinship or tradition, nor from political office alone or economic riches, but from the very synergy between political power and economic wealth in social relations. Thus, these oligarchies are aptly called an elite political-economic class. National oligarchies – often in alliance with key government decision-makers – carry a lot of clout over public policy-making processes, which may be mobilised to resist liberalisation measures that are deemed to challenge their monopolies or put their businesses at high risk of losing when faced with competition. But these established oligarchies also have “first-mover advantages” on the accumulation opportunities presented by liberalisation and privatisation – either because it would be relatively easy for them to diversify their businesses, or because of their political connections to state apparatuses, which decide, for example, who will be the favoured and winning bidders in the privatisation of government assets, and to whom infrastructure projects associated with liberalisation will be awarded. The entrenched oligarchies in respective ASEAN countries have historically dominated the accumulation of wealth in domestic economies. Neo-liberal reformers of the AEC are aiming at subjecting these oligarchies to the disciplines of “competitive capitalism”. At the same time, they also have strategies to forge “reform coalitions” with key elite stakeholders and open-minded sections of the oligarchical class to find and advance mutual interests in neo-liberalism. Domestic elites have different ways of negotiating and articulating their interests in the process of neo-liberalisation. Such room for manoeuvre has not been completely closed off for local oligarchies, despite the official accession of all 10 ASEAN states to the rules-based World Trade Organization, and the series of free trade agreements signed by the ASEAN bloc with the governments of Australia, China, India, Japan, New Zealand, and South Korea. Corporate elites in first-world Singapore, or in oil-rich Brunei, may have sound rationales for welcoming the opening up of all of the region’s national economies for foreign investments and ownership. Oligarchs in the emerging markets of Indonesia, Malaysia, the Philippines, and Thailand may lobby for continued protection of their industries; or they may opt for selective liberalisation of certain economic sectors. Local political-business elites in the lesser-developed economies of Cambodia, Laos, Myanmar, and Vietnam may assert the strategic need for infant industry protection; or they may find it profitable to form joint ventures with foreign investors at the infant stages of their economic development. In dealing with the constraints and opportunities in globalisation, for instance, state elites in Southeast Asia’s emerging markets (i.e. all ASEAN countries, with the exception perhaps of Singapore) oftentimes resort to political accommodations, which themselves are conflict-ridden and involve varying vested interests and different ideologies from groups and individuals. State-class relationships can be more capricious when international capital comes into the domestic accumulation regime with its own interests, either to compete or collude with the state and/or the local elites. States can be captured through international capital, but local dominant classes can also use them whenever there is conflict between domestic and international capital. It is for this reason that state-class analysis of the impact of the ASEAN economic regionalisation processes on national and regional political economies must be context-specific. 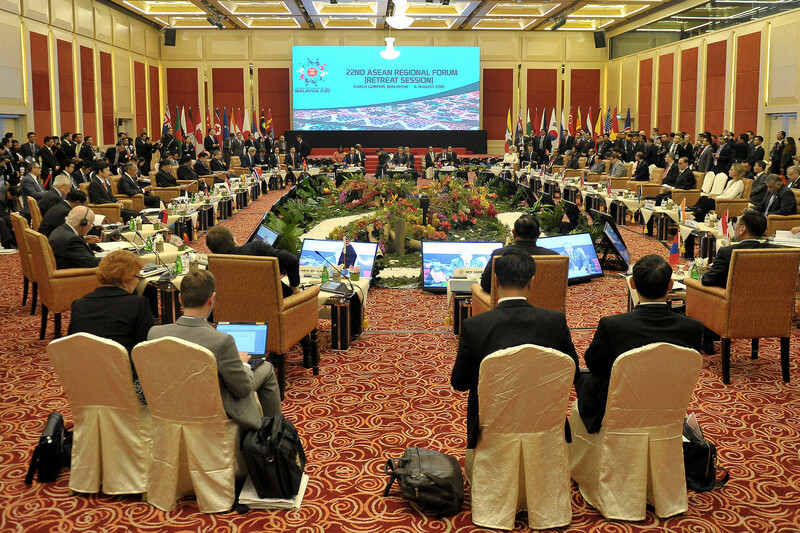 ASEAN itself as a regional institution is an embodiment of free-market ideas and discourse. It serves a mediating role for proponents of neo-liberalism. Neo-liberal reforms that cannot be attained in respective national economies are being elevated at the ASEAN regional level, which, in turn, can be utilised to compel domestic economies to conform with rules of liberalisation. International capital – either its actual domestic presence or the attraction to it by national states – is capable of challenging, reconfiguring, or creating national/domestic bourgeoisies. Through co-optation, for instance, international capital has the means and capability to broker a compromise between leading local elites and make these elites agree on economic reforms by creating vested interests in neo-liberalism. At the same time, when international capital penetrates into the national state, it does not merely signify monetary presence but becomes a powerful domestic social force with influence on political, economic, and cultural relations. This, however, does not suggest total powerlessness of national elites, because they also have their own political leverage vis-à-vis international capital and own material interests in the neo-liberalisation process. Major economic restructuring – as envisioned in the AEC – will, if implemented, surely affect regional and local patterns of accumulation as well as domestic and intra-ASEAN social relations. These economic reforms will most likely result in: firstly, intense political and social conflicts, with powerful domestic elites exerting their influence over policy formulations and the general process of capital accumulation; and secondly, new political-business alliances and class formations through partnerships, negotiations, consociation, or co-optation. The shape of ASEAN’s neo-liberal regionalism will be largely determined by the extent to which the region’s domestic bourgeoisies: a) have been “coerced” (by the alliance of international capital and national governments purposefully enforcing the rules of competitive capitalism); b) have been “co-opted” (to join the common accumulation interests of governments and international capital); or c) have “consented” (to the hegemony of neo-liberalism). The future of regionalism in Southeast Asia is open-ended. The contradictions arising from the elitist nature and elite-driven character of ASEAN community-building and regionalisation processes point at the ways where opposition can be mounted and the reasons why an “alternative regionalism” project “from below” is possible and necessary. This article was published in our dossier "Understanding Southeast Asia". The implementation of the ASEAN Economic Community in 2015/2016 will have drastic impacts on the socio-economic development and democratization of the ten member countries. This dossier and the lecture series seek to explain current political developments, societal changes and economic trends in the region. Some countries, as Vietnam, fear it, others, like Thailand, have high hopes - what can be expected of ASEAN's neo-liberal project? About its future perspectives and an alternative vision. Although ASEAN’s efforts to balance economic growth and environmental sustainability are growing, they are often overshadowed by the group’s economic integration agenda. Southeast Asian cities will play a critical role in the unfolding of the ASEAN Economic Community, which is to be launched at the end of 2015. A discussion of the inter-linkages among economic growth, urbanisation, consumption, and the environment.